PERRIS, CA – September 26, 2009 – 181 female skydivers from 31 countries joined together on September 26 at 1:30 p.m. Pacific Time to set a new women’s formation skydiving world record and raise over $900,000US for the fight against breast cancer, the most in the event’s history. The week-long event was organized to raise funds for City of Hope’s breast cancer research. 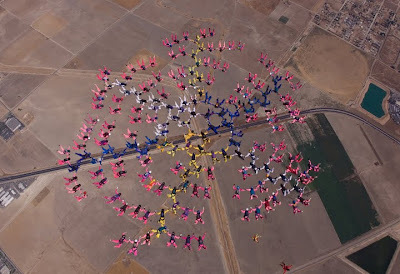 Sponsored by Jump for the Cause, a sky diving nonprofit organization, the event was held at the Perris Valley Skydiving Center in Perris, California, September 21-27 to kick off October’s Breast Cancer Awareness Month. 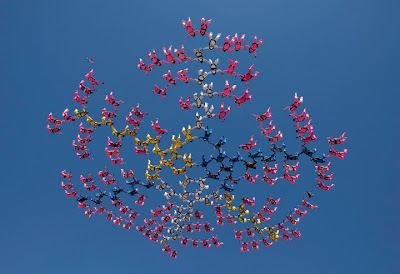 The Perris Valley Skydiving Center is the largest in North America providing 9 planes to lift the women to 17,000 ft. and create the new women’s world record formation skydive. Participants include breast and other cancer survivors, friends, family and supporters. Women from all walks of life with varied occupations and motivations worked together to be a part of this historic event and contributed to a cause that affects women worldwide. Carmen Irene, Marie Winther, Janet Lundquist (who is also in the first Blue Hole skydive photo! ), Lisa Walker, Melanie Peschio (she owns Skydive Perris with brother Pat), Ellen Monsees and Maxine Tate all have participated in the various Boogie in Belize trips in San Pedro Town. Great job ladies!